The Coxswain's Hammock, available standard on all Resolute bow-loaded fours (and to retro-fit any other boat), is one of our favorite cockpit inventions. It's a simple idea, implemented well. Resolute Racing Shells started putting these hammocks into their bow-loaded fours as an upgrade, but they were so popular they now come as part of the standard package. 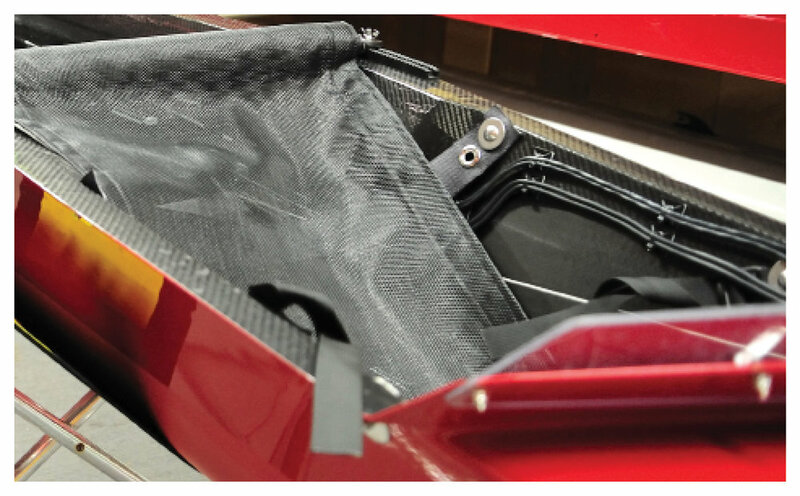 Breathable mesh zips around the cockpit crossbar by way of a padded foam roll that spans the entire width of the boat. The hammock attaches to the hull by a pair of connectors for the bottom hangers and a pair of connectors to adjust the tension of the hammock. And, of course, there's a pillow! The races we coxed in the hammock made us realize this was unlike any other cockpit stability device. The hammock supports your entire back and the headrest pressure that is typically a pain-in-the-neck was gone. There's even a benefit for your rowers: a happy coxswain, even when they're rushing the slide and creating check. Well, at least a happier coxswain! Hammocks aren't just for napping anymore; they're for winning.